Entered this one in my school's contest this year, and won! Beautiful!! Very creative! Glad to know that you won!! This is beyond incredible. I salute you. omg!!!!!! 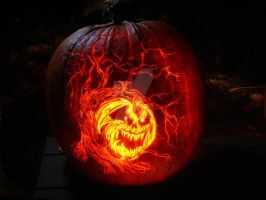 i wish i could carve like that!!! u got mad skills lol!!! 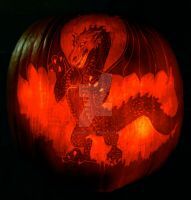 great job oh and what was the lame carving? im sure it didnt even compare to urs. OMG! This is amazing! Awesome job! wow, that must of taken ages. Thank you for reading, and have a fantastic October! I love this - just the kind of tiger design I want for a tattoo! 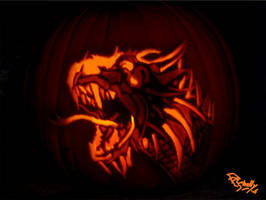 That is one of the most insanely detailed pumpkin I've ever seen! a-m-a-z-i-n-g work mate!!! how long did U spend 4 make it? & how big is it? is only one sadly thing... JUST 50$? That is absolutley spectacular! It's too bad this kind of art molds. Very cool, you totally deserved to win, I know how it is when idiots win things, it makes kittens die. Wow! This is gorgeous! Tigers are my favorite. Amazing job! Rock on, I'm impressed. Must have taken a lot of patience too. I like the leopard better, but this one is still great. Congrats on your win.